The Russian president’s remarks came one day after US secretary of state, Mike Pompeo, said Moscow was in “material breach” of the cold war-era treaty and issued a 60-day ultimatum for Russia to correct the alleged violations. Otherwise, the US would quit the 1987 accord, seen as a milestone in reducing the threat of a nuclear war in Europe, he said. 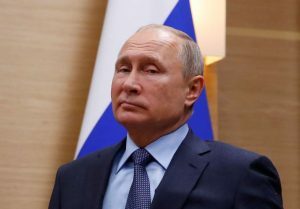 In Moscow on Wednesday, Putin told journalists that the US had provided “no evidence” of Russian violations, and threatened an arms race if the US sought to develop new medium-range missiles after exiting the treaty. The arms treaty, signed by Ronald Reagan and Mikhail Gorbachev, banned ground-launched missiles with a range between 500-5,500km. The US and Nato have said that tests of a new Russian cruise missile, designated 9M729, violate the treaty. The US effort to exit the treaty was spearheaded by John Bolton, Donald Trump’s hawkish national security adviser. According to a leaked memo published by the Washington Post, Bolton has ordered the Pentagon to “develop and deploy ground-launched missiles at the earliest possible date”. While it would take a substantial length of time to develop an entirely new missile, existing medium-range weapons in the US arsenal, such as sea-launched Tomahawk cruise missiles, could be adapted for ground launch more quickly, arms experts said. The standoff comes amid a buildup of Russian and Nato forces in Europe, including nuclear forces. Nato claims that Russia has deployed nuclear-capable missiles to Kaliningrad, and on Wednesday the Russian military confirmed it had deployed powerful new anti-ship missiles to Crimea following last month’s maritime clash with Ukraine. Next articleBrexit timeline: What’s expected to happen next?